It's been one year since Comcast started its monster project to blanket the entire nation with continuous Wi-Fi coverage. 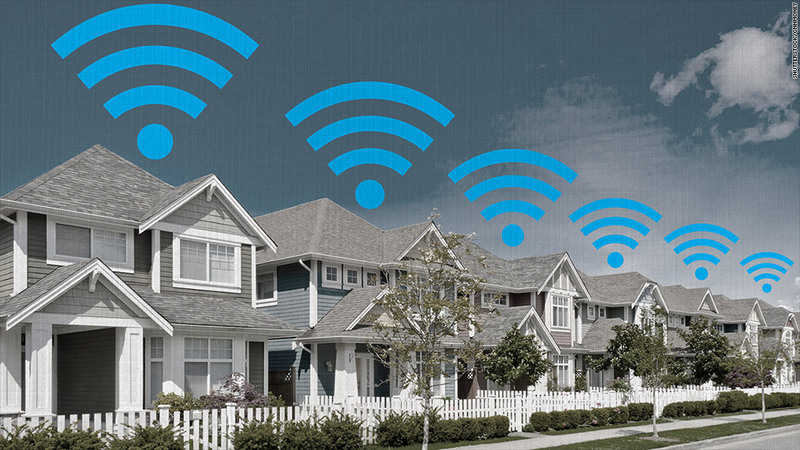 Imagine waves of wireless Internet emitting from every home. If you're a Comcast cable customer, your home's private Wi-Fi router is being turned into a public hotspot. It's potentially creepy and annoying. But the upside is Internet everywhere. It's been one year since Comcast (CMCSA) started its monster project to blanket residential and commercial areas with continuous Wi-Fi coverage. Imagine waves of wireless Internet emitting from every home, business and public waiting area. Comcast has been swapping out customers' old routers with new ones capable of doubling as public hotspots. So far, the company has turned 3 million home devices into public ones. By year's end it plans to activate that feature on the other 5 million already installed. Anyone with an Xfinity account can register their devices (laptop, tablet, phone) and the public network will always keep them registered -- at a friend's home, coffee shop or bus stop. No more asking for your cousin's Wi-Fi network password. But what about privacy? It seems like Comcast did this the right way. Outsiders never get access to your private, password-protected home network. Each box has two separate antennae, Comcast explained. That means criminals can't jump from the public channel into your network and spy on you. And don't expect every passing stranger to get access. The Wi-Fi signal is no stronger than it is now, so anyone camped in your front yard will have a difficult time tapping into the public network. This system was meant for guests at home, not on the street. As for strangers tapping your router for illegal activity: Comcast said you'll be guilt-free if the FBI comes knocking. Anyone hooking up to the "Xfinity Wi-Fi" public network must sign in with their own traceable, Comcast customer credentials. Still, no system is foolproof, and this could be unnecessary exposure to potential harm. Craig Young, a computer security researcher at Tripwire, has tested the top 50 routers on the market right now. He found that two-thirds of them have serious weaknesses. If a hacker finds one in this Comcast box, all bets are off. What about connection speed? Having several people tapping a single machine tends to clog up the Wi-Fi. Comcast says it found a way to make this work. With two separate networks, each antenna has its own data speed cap. Comcast said the private channel provides whatever speed customers already pay to get (most have 25 Megabits per second). The public hotspot channel is given 15 Mbps and allows up to five people to connect at a time. That means having your data-hungry friends over shouldn't slow down your Netflix (NFLX) stream. Comcast spokesman Charlie Douglas promised "there's more than enough capacity" in the cables connecting to people's homes to make this work. Comcast's project that started in northern New Jersey has now spread to Boston, Chicago, Houston, Indianapolis, Minneapolis, Philadelphia, San Francisco, Seattle and elsewhere. But what if you hate the idea of your private boxes turned into public hotspots? You can turn it off by calling Comcast or logging into your account online. The company says fewer than 1% of customers have done that so far.